force of the external return spring on the ECI injector, the upper timing chamber will continue to fill with pressurized fuel. 5. When the engine camshaft lobe starts to lift the injector cam follower roller, the pushrod moves up and the rocker arm reverses this motion to push the timing plunger downward. On the initial downward movement, the injector control valve remains open and fuel flows from the timing chamber and through the control valve to the fuel supply passage. When the ECM closes the control valve, fuel is trapped in the timing chamber; this fuel acts as a solid hydraulic link between the timing plunger and metering piston. The downward movement of the timing plunger causes a rapid pressure increase in the trapped fuel within the metering chamber. At approximately 5,000 psi, the tapered needle valve in the tip of the injector will be lifted against the force of its return spring and injection begins. 6. Injection will continue until the spill passage of the downward-moving metering piston uncovers the spill port. Fuel pressure within the chamber is lost and the needle valve reseats by spring pressure. This terminates injection. Immediately after the metering spill port is uncovered, the upper edge of the metering piston also passes the timing spill port to allow fuel within the upper timing chamber to be spilled back to the fuel drain, as the timing plunger completes its downward movement. Injection has now been completed. The American Bosch fuel injection system is used on multifuel engines. The pump meters and distributes fuel. It is a constant-stroke, distributing-plunger, and sleeve-control type of pump. As with other fuel systems, only clean fuel should be used. Good maintenance of the filtering system and reasonable care in fuel handling will give trouble-free operation. Fuels used in the multifuel engine must contain sufficient lubrication to lubricate the fuel pump and injectors. Because of close tolerances, extreme cleanliness and strict adherence to service instructions are required when it is time to service this system. The PSB model fuel pump is similar to other distributor fuel system, in that a pump sends a measured amount of fuel to each injector at a properly timed interval. The difference in the PSB system is that the amount of fuel sent directly from the pump at high enough pressure needed for injection. This eliminates the need for unit-type injectors and the associated linkage and camshaft, making the system less cumbersome. The purpose of the fuel pump (fig. 5-31) is to deliver measured quantities of fuel accurately under high pressure to the spray nozzle for injection. 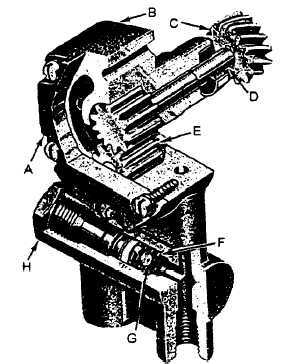 The positive displacement fuel supply pump (fig. 5-32) is gear-driven by the pump camshaft through an engine camshaft gear and provides fuel to the hydraulic head for injection and cooling. Figure 5-32. - Fuel supply pump assembly - sectional view.